The idiom in this episode is called: 一字千金 which means, one word equals one thousand pieces of gold. That's a lot of gold! Why are words so expensive? Listen to find out! This is where I introduce ancient Chinese idioms (成语故事) that have been passed down for centuries, and I do my best to make them more understandable to the non-Chinese-speaking world. Learning Chinese is HARD. Even a fluent speaker like myself (so humble I know...) will have trouble understanding the backstory behind each idiom. But I cannot emphasize the importance of learning Chinese in this decade. So here's to making my language fun! I'll begin the first entry with the importance of the number one. During China's Warring States circa 475-221 BC, a wealthy businessman by the name of Lu Bu Wei became the prime minister. He invited celebrity scholars from across the land, and gathered at least 3,000 of them all at once. Prime Minister Lu asked them to collect their finest work to put together one final masterpiece. This compilation resulted in 26 volumes, with an estimate of 260,000 words, featuring content about everything in life. Prime Minister Lu called it, <The Annals>, and published it for the world to see. He decreed, "Anyone who can find fault in the compilation of works, or can eliminate even one word, will receive 1,000 pieces in gold." Several days passed, and not a single soul dared to edit <The Annals> for the people feared the power of Prime Minister Lu. Nobody wanted to challenge authority. Moral of the Idiom: It literally meant that one word was equal to 1,000 pieces in gold. 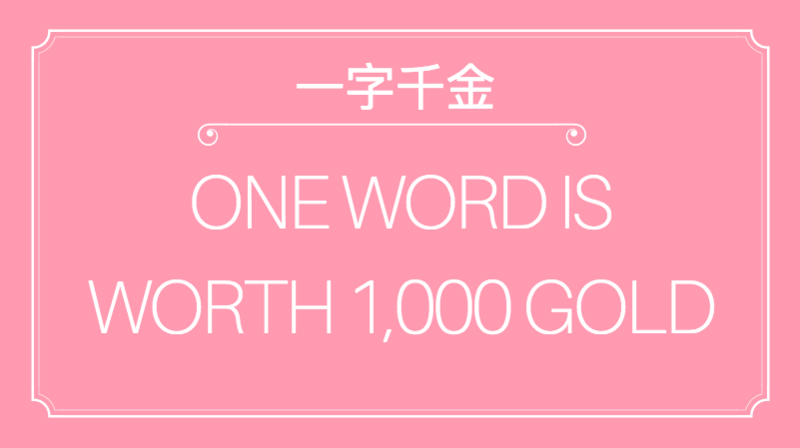 "One Word is Worth One Thousand in Gold" refers to the massive power that can come from a single word. Older PostEASY CHINESE IDIOMS...FIRST PODCAST!